After arriving in Bowser the previous evening, Bob and I were eager to greet the first day of our stay on Vancouver Island, British Columbia. We were thrilled that Bob’s sister Claire, and husband Martin planned to take us snowshoeing on Mount Washington, which required a drive along the coast through Fanny Bay. That is where Martin urged us to pull over so we could see the huge colony of California Sea Lions that had congregated there. 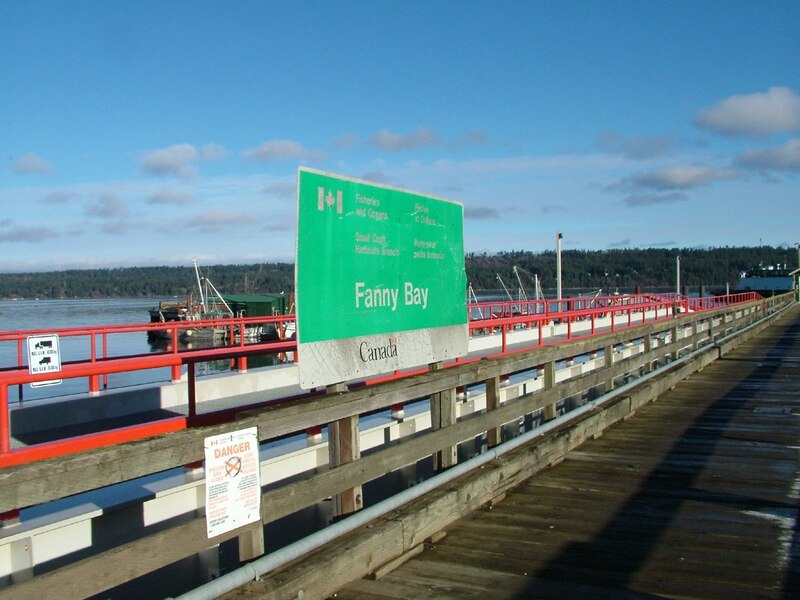 Fanny Bay is a tiny oceanside hamlet situated on Baynes Sound, a sheltered, narrow strait that separates Vancouver and Denman Islands. 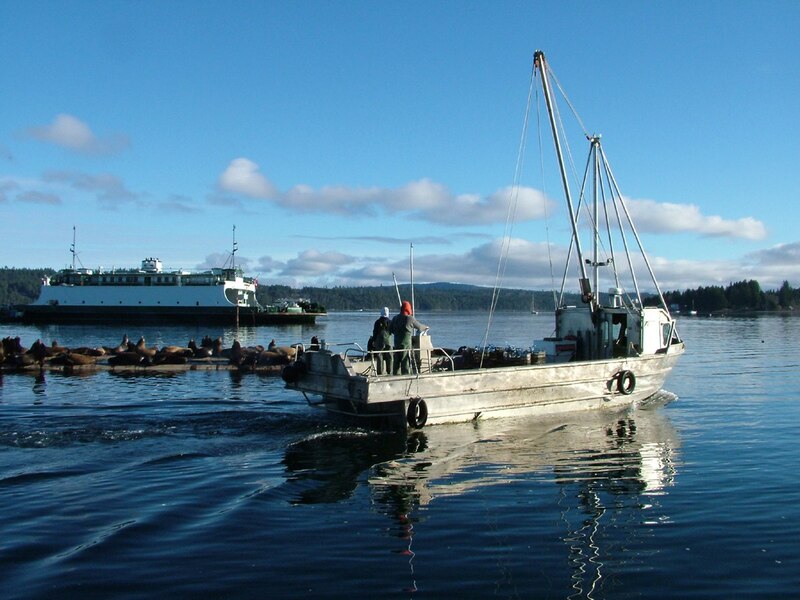 It is a pretty location with the mainland mountains providing a distant backdrop to the tranquil community. 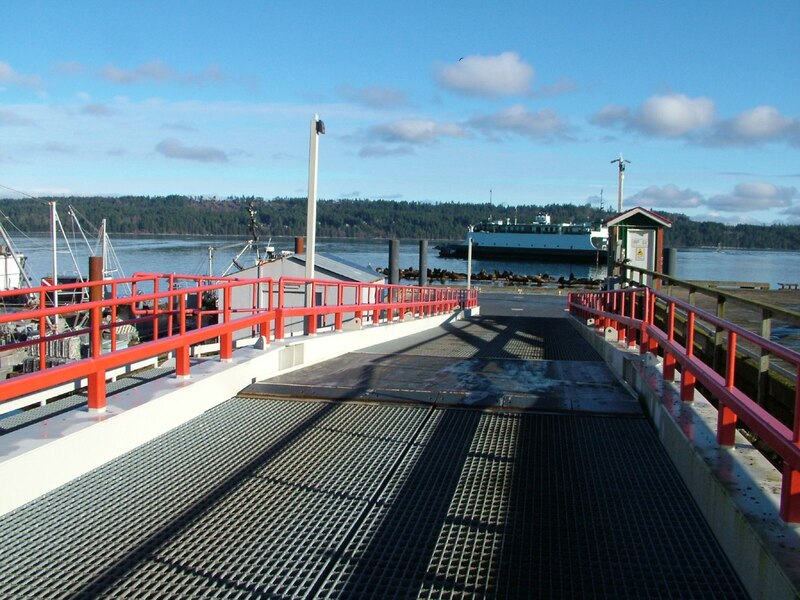 The Government Wharf in Fanny Bay provides a place for boats to dock, and at the end of the wharf, there is a collection of pontoon floats that act as breakwaters for the wharf and moored vessels. It is upon those man-made platforms that the California Sea Lions haul themselves out of the water. 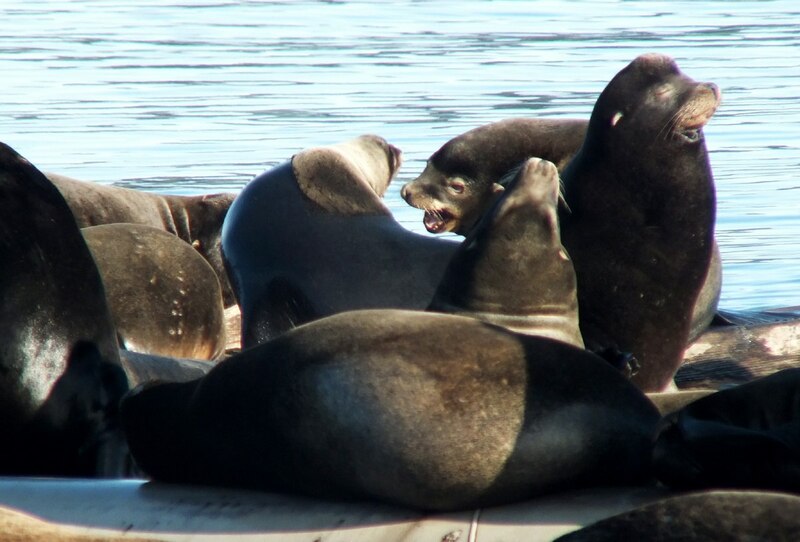 The California Sea Lions are removed enough from the shore to feel safe, and even with many onlookers within sight, the Sea Lions can sleep in peace. 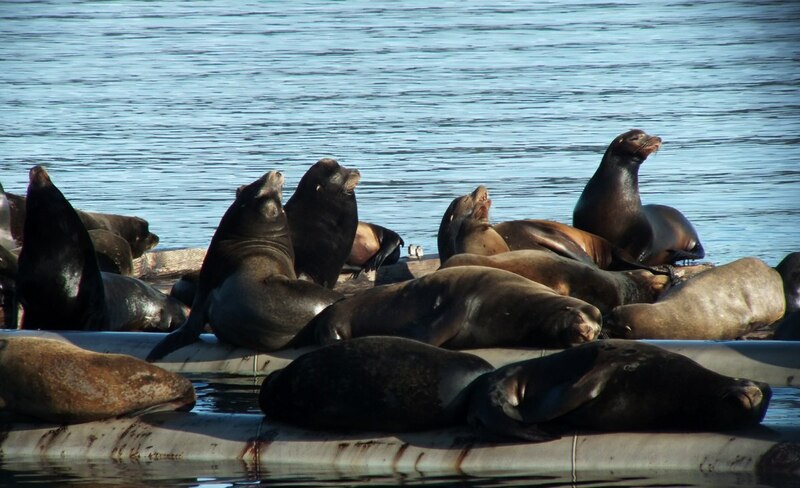 Unless they were jockeying for position on the platforms or demonstrating their machismo, the Sea Lions simply lie in the sunshine looking like large, brown, slippery blobs. 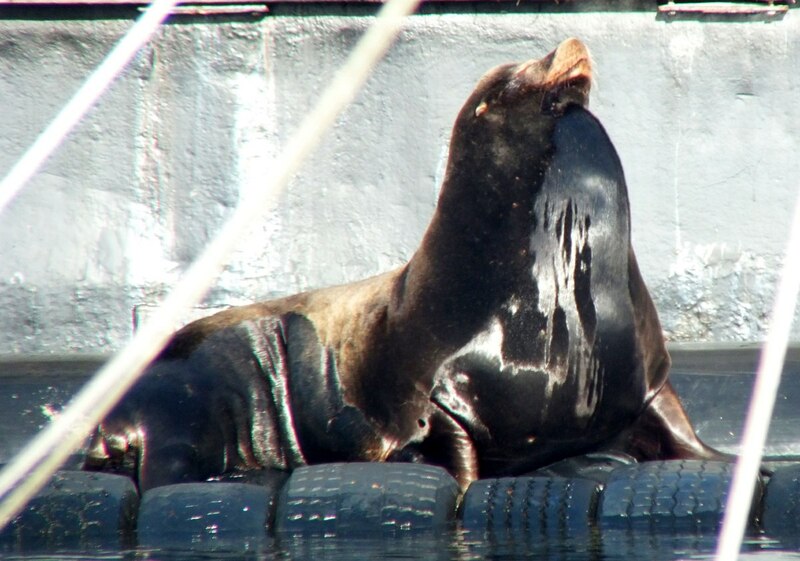 They are magnificent marine mammals as we can see when looking at this gigantic Sea Lion basking in the sun. Despite their size, California Sea Lions are sleek animals whose size belies the fact that they are the fastest of any other sea lion or seal. Males can weigh as much as 850 lbs (390 kg) and be a staggering 7 ft (2.1 m) in length. Females are proportionately smaller, up to 6 ft (1.8 m) in length and weighing in at as much as 220 lbs (110 kg). 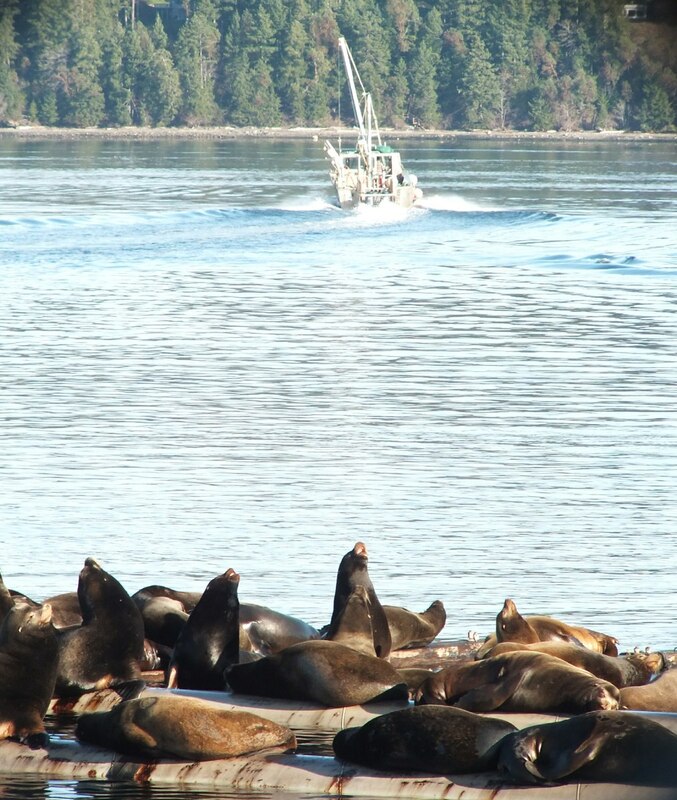 It is customary for the California Sea Lions to congregate in Fanny Bay each winter as they wait for the herring to spawn in February. They amass in anticipation of the feast. The normal range for California Sea Lions is anywhere from Vancouver Island, British Columbia, south to the tip of Baja California in Mexico, and there is also a population near the Galapagos Islands of Ecuador. 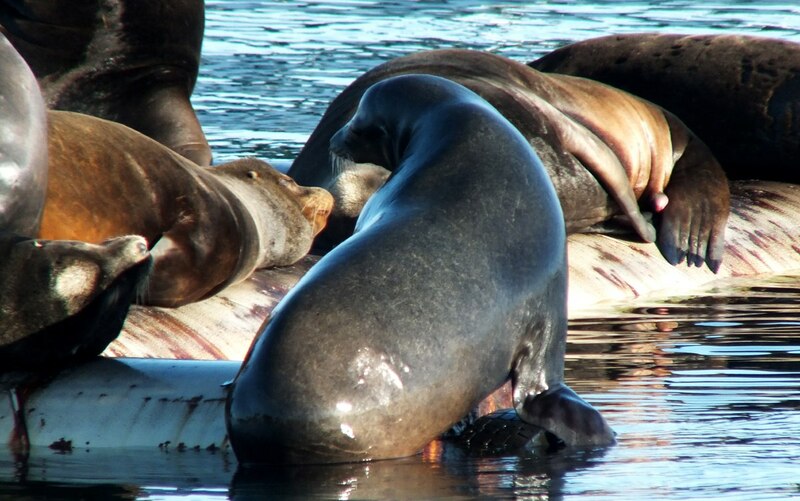 California Sea Lions typically assemble into huge colonies that include multiple females collected by each male for the purpose of siring young pups. When it comes to breeding and birthing, the colony will take up residence on seaside rocks, sandy shores or any man-made structure that suits the purpose. California Sea Lions range in colour from chocolate brown to a lighter golden brown in females. 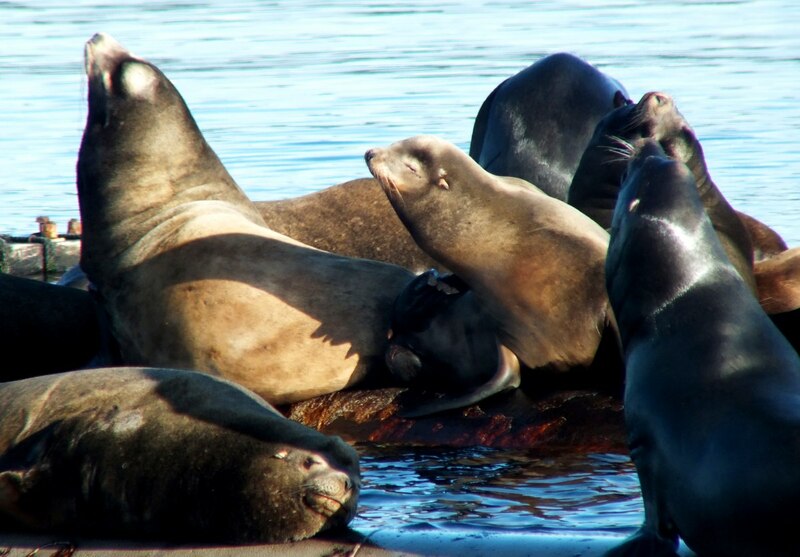 The males develop a bony bump on top of their heads at around 5 years of age, and that sagittal crest helps observers distinguish between these sea lions and other species seen around Vancouver Island. As the Sea Lions mature, the fur on the crest starts to turn white. 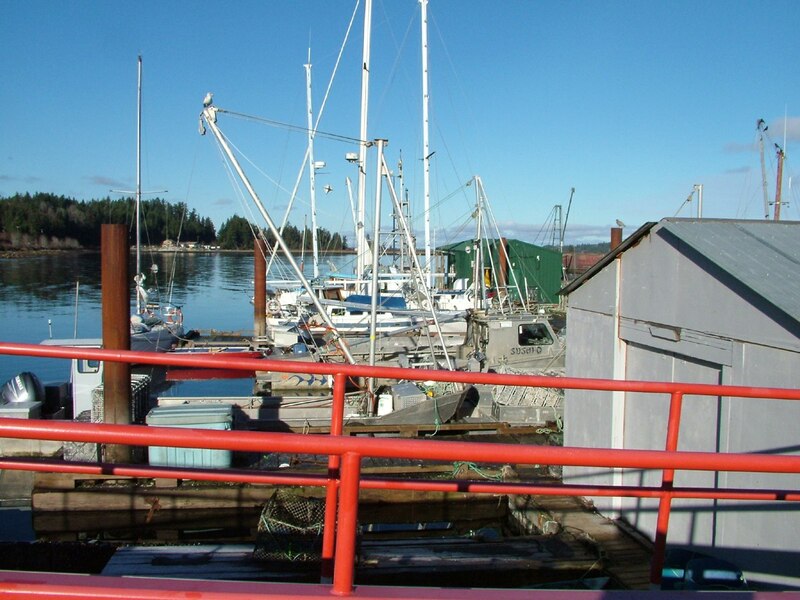 As Bob, Claire, Martin and I stood on the dock of the bay, a series of fishing boats departed, giving a wide berth to the colony of Sea Lions. 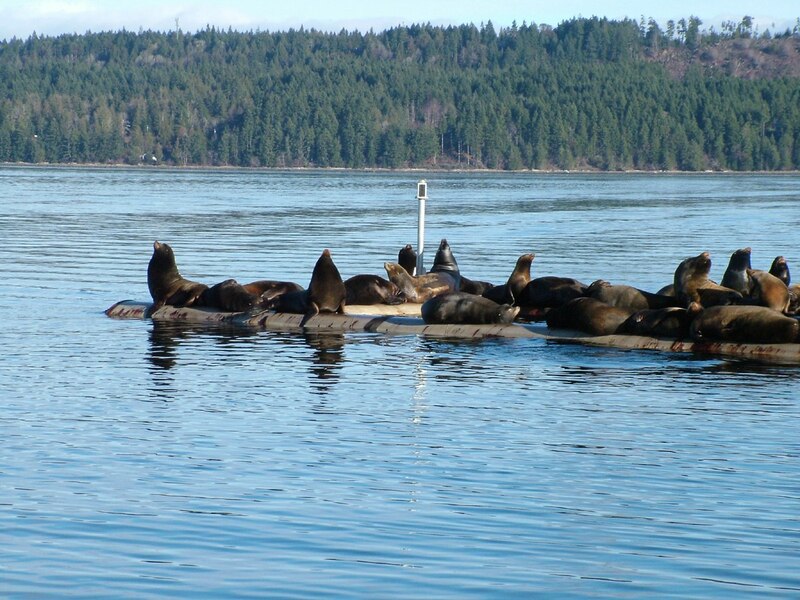 In previous years, before the pontoon floats were put in place, the Sea Lions used to haul themselves up onto the log booms on the other side of the bay. With their sleek, torpedo-shaped bodies, in combination with their powerful flippers, the California Sea Lions are well adapted to an aquatic life. In fact, they can achieve speeds in the water of up to 40 km/hour (25 mph). They are pinnipeds, which means three things: they lead a semi-aquatic life, are carnivorous, and have four limbs that are modified into flippers. A unique feature of the rear flippers is that they can be rotated into a forward position to facilitate “walking” on land. I marveled at some of the Sea Lions that dove off the platform because they remained underwater for almost ten minutes before resurfacing. When diving deep, California Sea Lions are capable of slowing their heart rates in order to remain submerged at length, which gives them an advantage over their prey. The thick layer of blubber that we can see rippling beneath their skin serves to insulate them well from the chilly ocean water. 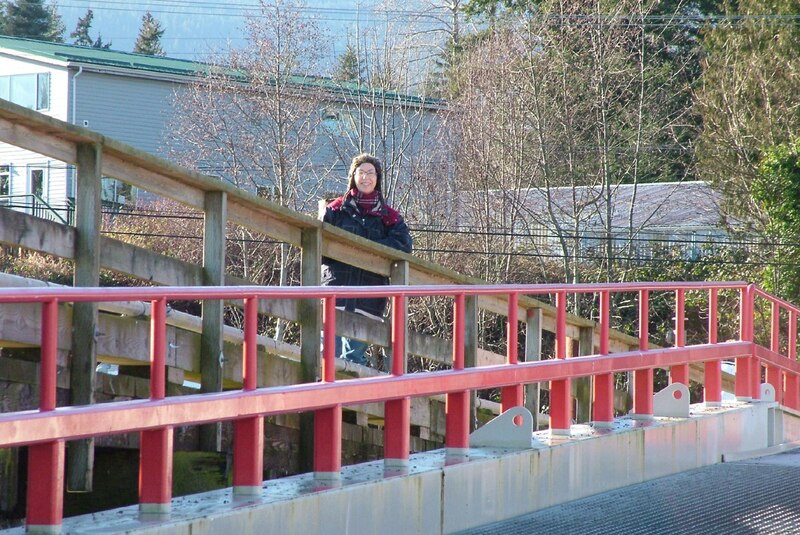 Even standing on the wharf where it meets the parking lot, I was able to hear the constant barking of the Sea Lions. Males defending their territory or during breeding season tend to be the loudest and most frequent callers, but if alarmed by a human, the males emit a long, low grunt. A female’s barks are higher pitched and more brief than those of a male. I was surprised to learn that the California Sea Lions are able to vocalize underwater, making such sounds as a whinny, buzzing or clicks. California Sea Lions are known as intelligent, playful animals, which might explain their highly social nature. 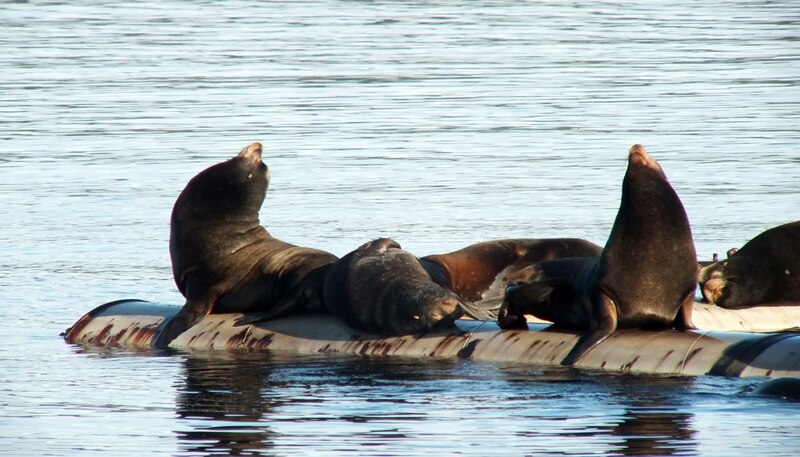 Even when at sea, they will often rest together in a large floating group known as a raft. For fun or in order to swim more quickly, these Sea Lions will jump free of the water like porpoises, and have even been known to surf on breaking waves. After spending about a half hour filming and photographing the California Sea Lions, it was time to continue on up to Mount Washington. 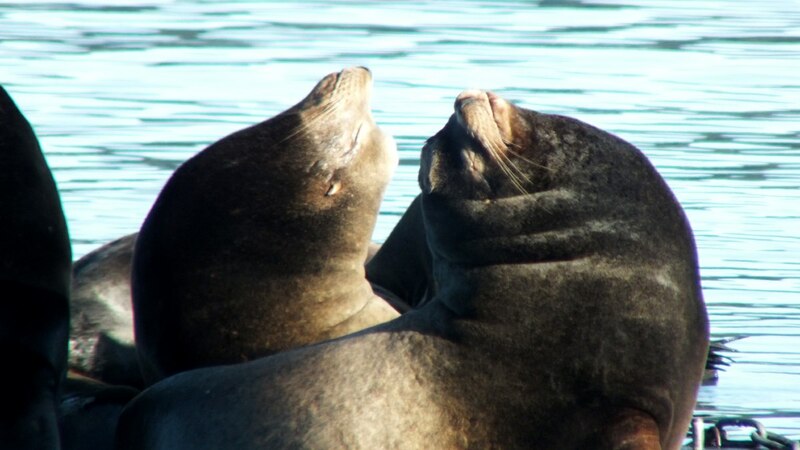 We left these two Sea Lions soaking up the warm sunshine as we headed off to catch a few rays of our own. They are alot larger than I thought! They are majestic and yet cute at the same time with their noses turned to the sky and a look of bliss on their faces. Thanks for your comment, Renee.